Fox’s prime-time network attractions and Fox4’s local newscasts sailed through Wednesday’s D-FW Nielsens on the eve of ABC’s ratings takeover with the first game of the NBA Finals. A double helping of Masterchef set the pace in total viewers from 7 to 9 p.m. before Fox4’s local news won the 9 p.m. hour. Among 18-to-49-year-olds, the 8 p.m. episode of Masterchef and Fox4’s news took the top spots while the 7 p.m. hour of Masterchef shared first place with NBC’s competing first portion of American Ninja Warrior. NBC’s premiere of the sci-fi drama series Reverie came in third at 9 p.m. with 99,709 total viewers and 21,844 in the 18-to-49-year-old realm. The leader at that hour, Fox4’s news, had respective totals of 220,785 and 62,412 viewers. FX’s series final of The Americans received a lot of publicity and critical acclaim. But in D-FW, hardly anyone watched it Wednesday night. The Americans lured just 28,488 total viewers and 12,482 in the 18-to-49-year-old sweet spot. Back-to-back late night repeats registered “hashmarks” (no measurable audience) in both ratings barometers. In the four-way local news derby results, Fox4 took the 10 p.m., 6 a.m. and 5 p.m. competitions in total viewers and with 25-to-54-year-olds (main advertiser target audience for news programming). Fox4 also ran first among 25-to-54-year-olds at 6 p.m., but had to share the total viewers gold with TEGNA8. The final performance edition of ABC’s American Idol reboot couldn’t cut it Sunday night opposite formidable competition on three rival networks. Airing from 7 to 9 p.m., Idol averaged 170,930 D-FW viewers in running fourth behind CBS’ 2-hour NCIS: Los Angeles season finale (227,907); the first two hours of NBC’s Billboard Awards show (206,541) and TNT’s Golden State Warriors-Houston Rockets Western Conference finals game (185,175). Inaugural Idol champ Kelly Clarkson hosted the Billboard show, which made it doubly delicious for NBC. Clarkson, also a judge on The Voice, will get to go opposite Idol again on Monday night. Among advertiser-prized 18-to-49-year-olds, the Warriors’ 41-point demolition of Houston dominated Sunday night with 106,100 viewers. Idol also trailed the Billboard awards in this key demographic and was outdrawn from 7 to 8 p.m. by Fox’s The Simpsons and Brooklyn Nine Nine. Sunday’s final round of Dallas’ Byron Nelson PGA tournament, hit with a four-hour rain delay, peaked between 5:30 and 6 p.m. with 163,808 total viewers before giving way to CBS’ 60 Minutes. The rest of the tournament was exiled to the Golf Channel, where it averaged 56,977 total viewers before ending just before darkness prevailed. Pip, pip, let’s go to very early Saturday morn, where coverage of the royal wedding of Prince Harry and Meghan Markle got underway at 3 a.m. NBC’s presentation hit a high point of 185,175 total viewers between 7:15 and 7:30 a.m. while ABC reached its peak from 7 to 7:15 a.m. (178,053 viewers). CBS lagged with a top crowd of 99,709 viewers between 6:45 and 7 a.m. In the cable universe, CNN, Fox News Channel and MSNBC all finished well back, with CNN and FNC both maxing out with 64,099 viewers. Also on Saturday, NBC’s coverage of the Preakness drew 199,419 viewers during the 15-minute early evening window when the race was actually run. Saturday night’s Cleveland Cavaliers-Boston Celtics Eastern Conference finals game averaged 142,442 total viewers on ESPN, with 93,618 of them in the 18-to-49-year-old realm. Friday’s prime-time attractions were paced by CBS’ Hawaii Five-0 in total viewers (220,785) while Fox’s Masterchef Jr. led the 18-to-49 pack with 28,085. Here are Friday’’s local news derby results, with just three weekdays now left before the May ratings “sweeps” end this Wednesday. Fox4 again did likewise at 6 a.m. while TEGNA8 notched twin wins at 6 p.m. Fox4 drew the most total viewers at 5 p.m. and NBC5 nipped TEGNA8 for the top spot with 25-to-54-year-olds. The Houston Rockets’ rout of the defending champ Golden State Warriors in Game 2 of their Western Conference finals gave TNT an explosive showing in D-FW Wednesday night among advertiser-coveted 18-to-49-year-olds. The game averaged 96,739 viewers in this key demographic, well more than half its total audience of 156,686. Prime-time’s No. 2-ranked attraction among 18-to-49ers, ABC’s 8 p.m. episode of Modern Family, had 78,015 viewers while CBS’ Survivor led all programming in total viewers with 178,053 during the 7 to 8 p.m. hour. Fox4 remained unbeaten in the sweeps at 6 a.m. with another pair of twin wins. The Peacock swept the 6 p.m. competitions and added a 5 p.m. win in total viewers. CBS11 drew the most 25-to-54-year-olds at 5 p.m.
Tuesday night again had no surprises. CBS’ NCIS drew the most D-FW viewers among all prime-time attractions and ABC’s Roseanne paced the ratings among advertiser-prized 18-to-49-year-olds. NCIS amassed 384,593 total viewers in the 7 p.m. hour before CBS’ two-hour NCIS: New Orleans controlled the rest of the night with 306,250. Among 18-to-49ers, Roseanne spoke loudest in the Big Four broadcast network universe with 96,739 of ‘em. From 7:30 to 10 p.m., the time slot winners in this key demographic were the second half-hour of NBC’s The Voice, Fox’s New Girl, the second half-hour of NCIS: New Orleans and NBC’s Chicago Med by a smidgen over the concluding hour of NCIS: NO. Here are Tuesday’s local news derby results for the 14th weekday of the 20-day May “sweeps” ratings period. CBS11 capitalized on the big NCIS: NO lead-in by winning comfortably at 10 p.m. in total viewers. Fox4 ran first with 25-to-54-year-olds (main advertiser target audience for news programming) while also running the table as usual at 6 a.m. With just six weekdays remaining in the sweeps, CBS11 remains in a solid position to pull off an upset total viewers win at 10 p.m.
Fox4 and NBC5 tied for the most total viewers at 6 p.m., with Fox4 winning outright among 25-to-54-year-olds. NBC5 enjoyed twin wins at 5 p.m., where it remains strong. The numbers for The Voice aren’t any better than American Idol’s down the homestretch of their latest singing competitions. But they again were good enough for NBC to have Monday’s top D-FW draw in both total viewers and advertiser-coveted 18-to-49-year-olds. From 7 to 9 p.m., The Voice drew 206,541 total viewers and 40,568 in the 18-to-49 realm. At 9 p.m., Fox4’s local newscast won in total viewers (170,930) and CBS’ Elementary took the 18-to-49 crown (24,965). Here are Monday’s local news derby results for the 13th weekday of the May “sweeps” ratings period. Fox4 came very close to winning everything, with 6 a.m. and 5 and 6 p.m. sweeps in total viewers and with 25-to-54-year-olds (main advertiser target audience for news programming) while also posting a 10 p.m. first in the 25-to-54 demographic. But TEGNA8 stepped in to narrowly outdraw Fox4 and NBC5 in the 10 p.m. total viewers competitions. Also of note: CBS11 sniffed the rarefied air of a second place finish at 6 a.m. among 25-to-54-year-olds. The station has a solid shot to finish third in this measurement for the entire May sweeps. CBS11 has only done this once before in its history, knocking TEGNA8 to fourth place several years ago. This time the dreaded bottom-scorer could be NBC5. But it’s still very much a horse race between the two stations. The blockbuster ratings of yore are no longer achievable. Still, ABC’s American Idol reboot has been a fairly steady plodder, without ever completely winning its time slot either on Sunday nights or directly opposite NBC’s The Voice on Mondays. Sunday’s live two-hour Idol, in which the show’s three finalists were selected, ranked as prime-time’s most-watched attraction in D-FW among advertiser-prized 18-to-49-year-olds with 74,894 of ‘em. But the Boston Celtics’ afternoon rout of the Cleveland Cavaliers in Game 1 of their Eastern Conference Finals had Sunday’s biggest haul, pulling in 90,497 for the ABC telecast. Idol’s 199,419 total viewers from 7 to 9 p.m. outdrew Celtics-Cavs but lost the 8 p.m. hour to CBS’ competing NCIS: Los Angeles (220,795 viewers). In Friday’s prime-time festivities, CBS’ 9 p.m episode of Blue Bloods again drew the most total viewers (270,640) while ABC’s Marvel’s Agents of S.H.I.E.L.D. nipped the Tom Selleck copper for the night’s top showing among 18-to-49-year-olds (23,092). Yeah, that’s pretty damned paltry in a market of 3.12 million viewers in this key demographic. CBS11 continued to make noise at 10 p.m. with its fifth win in six weekdays in total viewers. A first-place finish at 10 p.m. in this measurement would be a major plus for the struggling station, which still relies heavily on the kindness of its CBS network lead-ins. A win’s a win, though, and CBS11 definitely is very much in the race as it nears the home stretch. CBS11 also recorded a rare victory among 25-to-54-year-olds (main advertiser target audience for news programming), but has no shot to win the “sweeps” in this demographic. Fox4 cruised to two more wins at 6 a.m., where it’s already locked things up. But the station’s recent decision to start Good Day at 4 a.m., a half-hour ahead of its local competitors, so far has been a turnoff. Friday’s 4 to 4:30 p.m. portion of Good Day drew 2,137 total viewers and had “hashmarks” (no measurable audience) among 25-to-54-year-olds. That put it fourth in total viewers behind network news half-hours from ABC, CBS and NBC. Even with no audience among 25-to-54-year-olds, Good Day “improved” to a third place tie with CBS in that measurement. At 6 p.m., TEGNA8 won in total viewers and Fox4 had the edge with 25-to-54-year-olds. The 5 p.m. golds went to NBC5 in total viewers and Fox4 in the 25-to-54 realm. The very long-in-coming wedding of Sheldon Cooper and Amy Farrah Fowler gave CBS’ The Big Bang Theory an extra ratings booster shot Thursday. Big Bang drew 455,814 D-FW viewers compared to 370,349 for the previous Thursday’s episode. The show also had prime-time’s biggest haul of advertiser-prized 18-to-49-year-olds with 127,945. CBS went on to sweep the night in total viewers with Young Sheldon, a double shot of Mom and S.W.A.T.. Among 18-to-49ers, CBS won from from 8 to 9 p.m. with the two Moms while the second half of ABC’s Grey’s Anatomy whipped Young Sheldon and Fox4’s 9 p.m. local newscast narrowly outdrew S.W.A.T. CBS11 has emerged as a contender in total viewers at 10 p.m. with its fourth win in the last five days. Fox4 was tops with 25-to-54-year-olds. Fox4 also again ran the table at 6 a.m. and ran first at 5 and 6 p.m. in the 25-to-54-year-old demographic. NBC5 and TEGNA8 tied for the top spot in total viewers at 5 p.m. and TEGNA8 won outright in this measurement at 6 p.m.
Saul Garza, Jennifer Myers will no longer be early risers for Fox4. 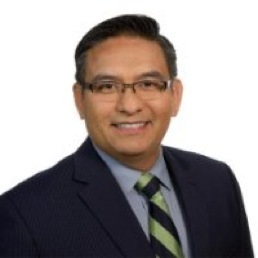 Garland will be the next stop for veteran Fox4 reporter Saul Garza. He’ll be starting June 4th as the city’s new Social and Media Relations Manager. Garza says he’ll also be “doing freelance stuff on the side that does not conflict with the city.” He likely will have the last week of May off at Fox4, leaving the station after a 19-year career, the last dozen or so as the station’s mainstay Good Day reporter. As first posted on unclebarky.com, Garza decided to try something new after hitting the burn-out stage as a field reporter whose wakeup calls were at 2:30 a.m. He later elaborated on his Facebook page. “For starters, regular hours, holidays off, my own office, an actual lunch break, a safe and healthy work environment and a lot less stress! Simply put . . . happiness!” Garza said in part. 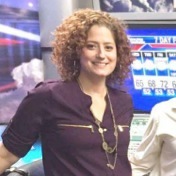 On her own Facebook page, Myers said Tuesday that her last day at Fox4 will be on Sunday, May 13th. As reported here earlier this week, Myers will be taking a position as meteorologist for North Texas-based ONCOR Electric. She’s yet to divulge this publicly and hasn’t commented to unclebarky.com. The first D-FW television station to rev up its weekday early morning show at 4:30 a.m. is striking again in hopes of further cementing its position as a dominant No. 1 in the local Nielsen ratings. 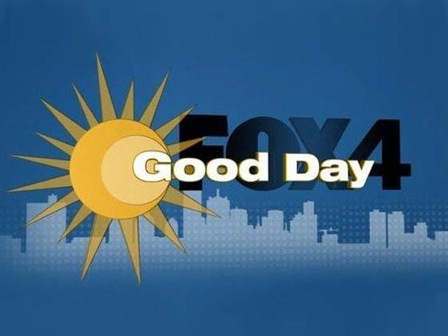 Starting on Wednesday, May 9th, Fox4’s Good Day will be firing up at 4 a.m. Including its 7 to 9 a.m. portion opposite the three network morning shows, that will mean five continuous hours on the air for the principal anchor duo of Tim Ryan and Lauren Przybyl. Station staffers were informed of the earlier startup just one morning before it actually happens. Management reportedly didn’t want to tip Good Day’s hand to the competition, but unclearky.com doesn’t play by those rules when news leaks out. 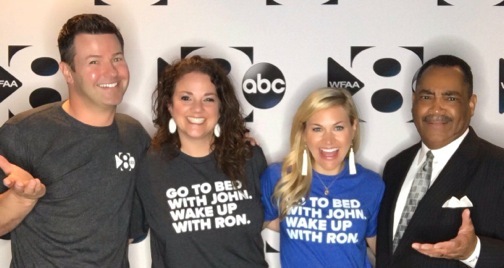 In April 2010, Good Day became the first D-FW morning show to turn the clock back from a 5 a.m. to a 4:30 a.m. start. NBC5, TEGNA8 and CBS11 soon all followed suit, and that likely will be the outcome this time as well. You’re welcome. Good Day continues to rule the early morning ratings in the most-watched 6 to 7 a.m. hour before likewise crunching the two-hour ABC, CBS and NBC network offerings in both total viewers and with 25-to-54-year-olds (main advertiser target audience for news programming). But the station is losing its longtime standout weekday early morning field reporter Saul Garza, who told unclebarky.com on Monday that he finally had buckled under the grueling early morning hours. And on weekends, anchor Jenny Anchondo recently left Good Day while her sidekick, meteorologist Jennifer Myers, will be exiting soon. Ryan, easily the dean of D-FW’s early morning anchors, is now in his 23rd year with Good Day. Rest assured, he’s not going anywhere in the immediate future. Otherwise rest is not assured. Prime-time’s most popular comedy (get back, Roseanne) again led Thursday’s pack. CBS’ The Big Bang Theory topped all TV attractions in both total viewers (370,349) and with advertiser-courted 18-to-49-year-olds (109,221). The network’s Young Sheldon, Mom and Life In Pieces also won their time slots in total viewers before Fox4’s local newscast took the 9 p.m. hour. Sequentially running first from 7:30 to 10 p.m. with 18-to-49-year-olds were the second half of ABC’s Grey’s Anatomy, Mom, Life In Pieces and Fox4’s news. Over on ESPN, the early-starting Cleveland Cavaliers-Toronto Raptors playoff game averaged 56,977 total viewers and 34,327 in the 18-to-49-year-old age range. A 5 p.m. tipoff didn’t help. The Texas Rangers’ relatively rare victory, over the Boston Red Sox on Fox Sports Southwest, outdid the Cavs-Raptors with a full-game average of 92,587 total viewers. But just 15,603 of them were in the 18-to-49 realm. Here are Thursday’s local news derby results for the sixth weekday of the May “sweeps” ratings period. Fox4 and NBC5 split all the spoils. Fox4 as usual swept the 6 a.m. competitions and added 6 and 10 p.m. wins with 25-to-54-year-olds (main advertiser target audience for news programming). 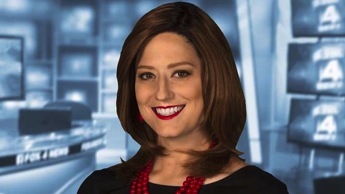 NBC5 had twin wins at 5 p.m. while running first in total viewers at 6 and 10 p.m.
She announced her decision to the news room and on her Facebook page, where O’Kelley said her last day at CBS11 will be May 23rd. She elaborated in later comments to unclebarky.com. In January of this year, O’Kelley took an extended leave of absence to undergo a hysterectomy. Late last year, she was hit with “excruciating pain just before the holidays,” O’Kelley said in a Facebook chat with co-anchor Doug Dunbar. 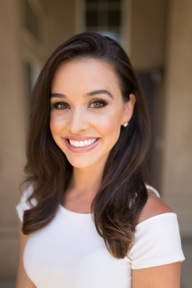 The Scottsdale, Arizona-based doctor who delivered both of her children recommended the surgery after expressing “some serious concerns about what is happening,” O’Kelley said. She returned to the air in March after missing the annual four-week February “sweeps” ratings period. CBS11’s Gilma Avalos filled in for O’Kelley during that period. The station’s director of communications, Lori Conrad, told unclebarky.com Thursday that CBS11 has “nothing to announce on that at this point” regarding an interim or permanent successor to O’Kelley. The ongoing May sweeps ratings period ends on May 23rd, which not coincidentally is the day that O’Kelley also is scheduled to say her goodbyes. And to think that Wednesday’s prime-time pacesetter in both major ratings measurements was once considered a lose-lose against all of those prime-time network heavy-hitters. Now differentiation has become a significant difference-maker, at least when it comes to watching TV programming at the appointed hour. Airing opposite first-run drama series on ABC, CBS and NBC, Fox4’s 9 p.m. local newscast again made this a truism. It drew the most total D-FW viewers (235,029) of any show at any hour while also tying Fox’s 7 p.m. episode of Empire for the top spot with advertiser-prized 18-to-49-year-olds (68,653 apiece). Otherwise CBS’ Survivor won the 7 p.m. hour in total viewers (199,419) while NBC’s Law & Order: SVU prevailed from 8 to 9 p.m. in that measurement (178,053 viewers). The 18-to-49 golds from 8 to 9 p.m. went to ABC’s Modern Family (62,412) and the second half of Fox’s Star (49,930). Fox4 had a big day in these four-way competitions, too, sweeping at 6 a.m., 6 p.m. and 10 p.m. in total viewers and with 25-to-54-year-olds (main advertiser target audience for news programming). Fox4 and NBC5 tied for first place in total viewers at 5 p.m., with the Peacock winning outright among 25-to-54-year-olds.